1924 – Bow Leonard Carpenter (Hotchkiss), (2) Frederick Sheffield (Groton), (3) Alfred Wilson (Andover), (4) James Stillman Rockefeller (Taft), (5) John Miller (Exeter), (7) Benjamin Spock (Andover), Cox Laurence (Chick) Stoddard (Exeter). ‘Hear The Boat Sing’ (HTBS) is best known for providing bespoke regatta reports, bits and bobs of rowing history not to be found anywhere else, coverage of special occasions and a quiet stream of rowing-related verse. 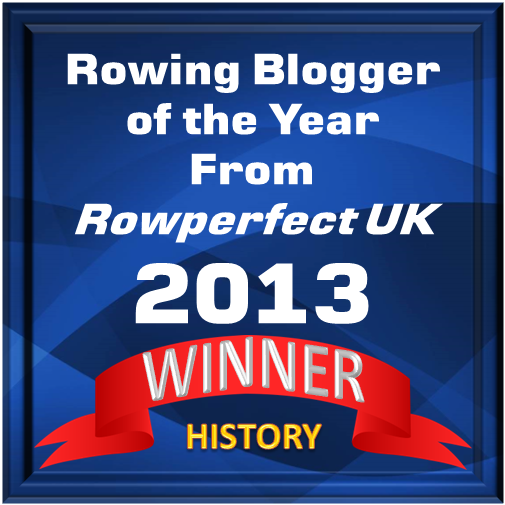 It can also be the source of rowing history quizzes, questions, queries and challenges. This post is a bit of everything. Most stereotypes contain an element of truth, and the old canard that rowing was a sport enjoyed only by the upper classes is no exception. On the U.S. side of rowing history, one has only to look at the lists of member clubs and the titles claimed in N.A.AO. and USRowing championships to be quickly disabused of the idea of any patrician supremacy, much less monopoly, in the sport. 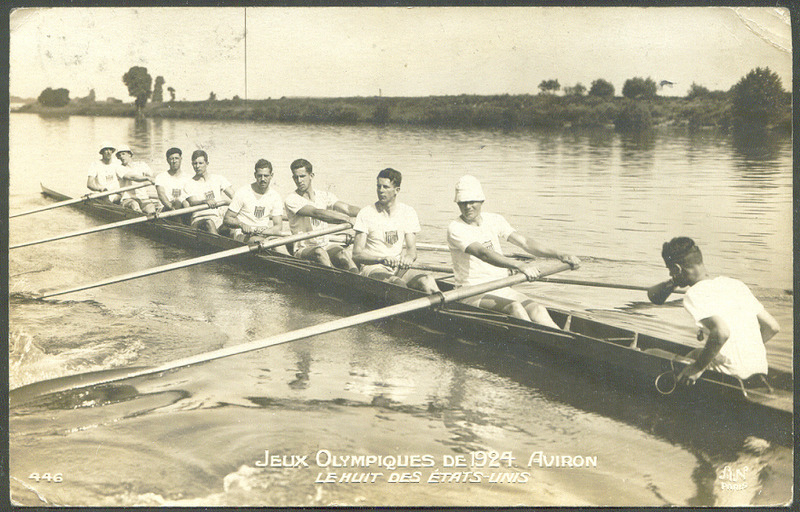 Even when Olympic gold was linked to collegiate eights at times when college attendance was not a national norm, the composition of eights from the Naval Academy, California or Washington (as so notably set forth in The Boys in the Boat) could hardly be considered to consist of athletes from upper class backgrounds. 1956 – Bow Thomas Charlton (St. Paul’s), (2) David Wight (Exeter), (4) Donald Beer (Groton), (5) Charles Grimes (Groton), (6) Caldwell Esselstyn (Deerfield), Stroke Robert Morey (Exeter), Cox William Becklean (Exeter). And then there were those 1924 and 1956 gold medal eights from Yale. It would be convenient to be able to crush that stereotype by pointing out that these crews were also made up entirely of boys on scholarship from blue-collar families, but the facts pose a problem. Indeed, of the 18 men in those boats, at least 14 came from boarding schools, suggesting a certain level of affluence in their backgrounds – the fabled exception to the rule. 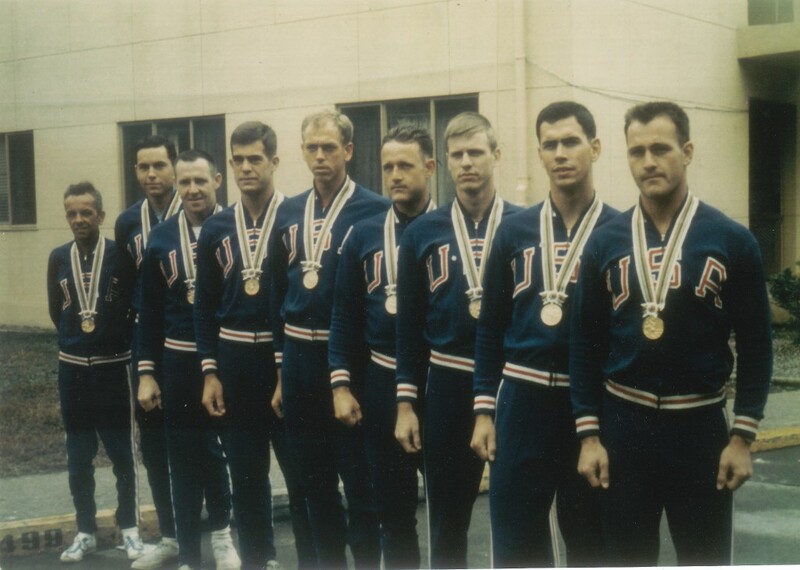 One might wonder what colleges could boast the greatest number of Olympic rowing golds won by its teams or alumns, but were one to try to build a database to link successful rowers to the colleges they attended, especially following the introduction of the national team model, it could take a bit of research. Were one to try to extend that linkage to the high schools they had attended, the task becomes exponentially more difficult. 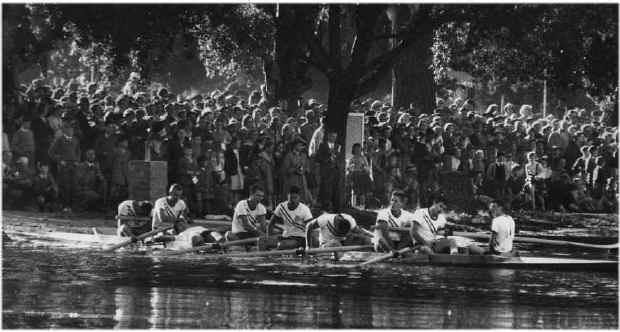 In looking at the backgrounds of those 1924 and 1956 crews, I was fortunate enough to have race programs that showed those schools, but that data is not readily available for the great majority of rowers, and any rowing historian investigating the subject of high school backgrounds will face a deficit of sources and a substantial task to complete the survey. My interest in the issue had been sparked by curiosity regarding the number of U.S. boarding school alumns who had won Olympic rowing gold. Lacking the time and energy to cast my net much wider, I first stuck with the 1924, 1956 and 1964 eights. Although an admittedly very limited sample size, it probably caught the great majority of potential candidates, and it produced the following distribution: Exeter 5, Groton 4, Andover 2, and 1 apiece for Deerfield, Hotchkiss, Kent, Lawrenceville, St. Paul’s and Taft (and as one who is very concerned with the fate of rowing memorabilia, it is of great interest to me that at least one alumnus of each of Exeter and Groton has given his medal to his school). A brief scan of additional databases reveals that three-time Olympic gold medalist Elle Logan attended Brooks, two-time gold medalist Caroline Lind is an Andover graduate (making that school’s total 3), and 2016 gold medalist Tessa Gobbo came from Northfield Mount Hermon. 1964 – [from left:] (2nd) William Stowe (Kent), (4th) Boyce Budd (Lawrenceville), (5th) Emory Clark (Groton). Who cares? Maybe very few (if you’ve read this far, thanks). But to look at linkages between successful rowers and their high school origins (including any rowing experience that might have been gained there) could certainly be a legitimate avenue of inquiry, whether just to flesh out a database, or actually to engage in an analysis of the data. Any budding rowing historian casting about for a new field of research might find diving into this utterly unexplored and potentially rich field of inquiry to be a rewarding pursuit. If you learn of any other boarding school alumns who have earned Olympic rowing gold, please let us know at HTBS. (And if you cared to expand that search to include Olympic silver and bronze medalists, or those who made world championship podiums, or everyone who made an Olympic or worlds or national team, just… go for it.) Thank you.